Home / Brexit / EU / Europe / Hookem / NATO / Opinions / Ukip / Ukip's 'EU Army' Will Never Happen, And Here's Why. Ukip's 'EU Army' Will Never Happen, And Here's Why. Ukip - and other Brexiteers - will tell you, even guarantee you, that if we stay within the EU, the UK will become part of an EU Army. Within a year or two, or maybe next Friday afternoon, or whatever. They will even try to tell you that this will mean the actual *end* of the British Army, the RAF, the Royal Navy and the Royal Marines. "The EU has a long record of creating institutions through the 'back door' and the creation of a EU Army will be no different. All of a sudden, the British public will be presented with a 'done deal' and British troops will find themselves operating under the EU flag rather than the Union flag." - Ukip. Usually this comes from Ukip's Mike Hookem - Ukip's 'Spokesperson for Defence' - a former soldier who should know better. Military service is supposed to instill integrity. He seems to have lost his when he handed in his single stripe. With this writer having served 18 years, and still up to date with current military news and affairs in NATO and Europe, perhaps I am in a position to clarify. It's a shoulder patch. It's not an EU Army. 1. Jean-Claude Juncker Advocated A "Common European Army"
BUT Juncker's view (expressed once - and never repeated that we can see) is immaterial. It's not his decision and never will be. His comment - lifted out of context by Brexiteers - was a warning shot aimed at Russia. This is clear when you read the full text. In June the EU’s foreign policy chief, Federica Mogherini, will outline a “global strategy on foreign and security policy”. This will call for deeper EU security and military cooperation, but it will not propose an EU army. “There is absolutely no plan to set up an EU army with the global strategy,” a spokeswoman for Mogherini said. Other officials have variously stated a desire to see plans for this, but again, their individual wishes are irrelevant. It's simply not their decision. Various British newspapers have stated the 'EU Army' as a fact. In practice, what these Brexit-backing newspapers have actually stated are 'opinions' of a few - with minimal informed sources. Member states simply do not want to cede sovereignty on defence policy, ever. The decision requires unanimity in the Council of Ministers. Many nations have already stated they would veto - including the UK. “Suggestions of an EU army are fanciful: national security is a national competence, and we would veto any suggestion of an EU army.” - Official UK Government Position. Brexiteers are confusing the Common Security and Defence Policy with an 'EU Army'. Simple souls that they are. BUT this is an agreement for European Nation troops to work together in humanitarian and rescue tasks, crisis management, and peacekeeping. Since 2003 the EU has launched some 30 joint peace missions and operations under CSDP - you have probably read about none of them. It does not cover defence of territory. That role is NATO, and no EU Government wants that to change. There is a need - agreed by many but not all EU nations - that in general, more defence integration would be a good thing, in certain areas. But this is not an 'EU Army', however much Ukip want to spin it as such. To understand the limitations in the Common Security and Defence Policy, and what it specifically does not cover, this document, "Understanding the Limitations of the EU’s Common Security and Defence Policy" is the easiest reference. BUT the key author Christian Moelling of the German Marshall Fund in Berlin stated that this the white paper is a theoretical exercise, and any implementation is subject to the vetos of individual nations. There is constant ongoing European Defence Co-Operation, always has been, even involving non-EU nations. It's a Europe thing, not an EU thing. For example, NORDEFCO sees Danish, Finnish, Icelandic, Norwegian, and Swedish forces training together. Because it makes sense. The Dutch and Germans train together. Mainly because Netherlands sold all their tanks and now rely on German armoured divisions. That was a budget decision made by the Netherlands Government. European nations are starting to specialise in expertise in certain aspects of military operations, so co-operation makes perfect sense. But this is not an 'EU Army'. The Franco-German Brigade is another example of co-operation. It's been deployed only once - in 27 years, and that was for a training mission in Mali (Nice work if you can get it!). It was suggested as an option for Afghanistan - but both nations vetoed it's use. 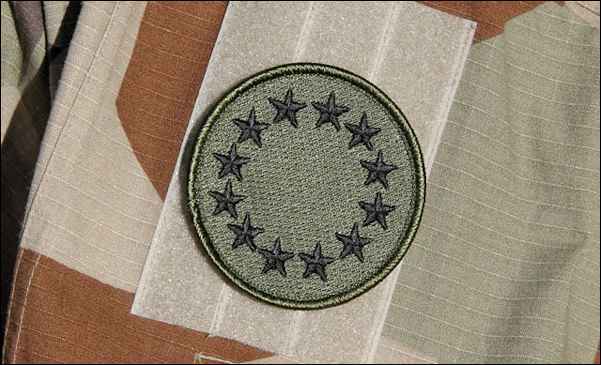 The above is part of EUROCORPS. It's a small voluntary group of 13 nations - and the UK isn't even part of it. It's been deployed in Bosnia, Kosovo and Afghanistan, on peacekeeping missions - but only with full agreement of every nation. We have the European Defence Agency to assist in co-ordinating defence planning between member-states. It's a Policy Body, not an Armed Force. We have the European Air Transport Command (EATC) in which every nation can refuse to take part on a mission-by-mission basis. Air-dropped supplies to disaster areas? That will be co-ordinated by EATC. We have the EU 'Battle Groups', since 2007, These are 'paper battalions' involving various European units on standby. They are designed for the Petersberg tasks - humanitarian, peacekeeping and peacemaking, not national defence. They've never been deployed, ever, due to no occasion ever getting the agreement of all nations involved. In fact, it's entirely possible that the EU will scrap this process. We co-operate on infrastructure and procurement. There are now standards for weapons calibres and equipment parts specifications so as much as possible is interchangeable and can be mass produced at less cost. This is mainly NATO driven, but adopted by non NATO nations as well - because it just makes sense. And we don't recall Ukip even complaining about the EF2000 Typhoon EuroFighter very much - a perfect example of EU Nation co-operation - but it's not an 'EU Air Force'. NO IT DOESN'T. You're thinking of the PESCO clause (Permanent Structured Co-operation). Yes, go and read it. Then ignore Farage's false 'interpretation' of it. "The Lisbon Treaty introduced PESCO to allow a core group of EU members to deepen their co-operation on military matters, when certain criteria were met. But the mechanism has never been used – countries chose instead to pursue military integration in small clusters outside EU structures. The political will for small-scale EU co-operation was never there." - Sophia Besch, Centre for European Reform. A theoretical 'EU Army' would basically duplicate NATO. You know, that unelected organisation in which we have very little say that Ukip fail to mention. 22 of 28 EU states are NATO members, and at the moment only 5 out of those 22 meet the agreed spending of 2% of GDP on Defence. Where Ukip think we'll get the money for an EU Army is beyond us. Juncker suggested it but he was taken out of context and it's not his decision anyway. Member States don't want it and most will veto it. Member States' Armed Forces don't want it and will press their governments to veto it. The Common Security and Defence Policy is not an 'EU Army'. Greater co-operation between forces of member states is not an 'EU Army'. The Lisbon Treaty does not mean we have to have an 'EU Army'.